Lock in a great price for Park Hyatt Dubai – rated 9.2 by recent guests! Service staff excellent. New pool area lovely. And as per usual great beds/rooms. Gorgeous property, friendly staff, excellent food, beautiful views, and pure serenity. 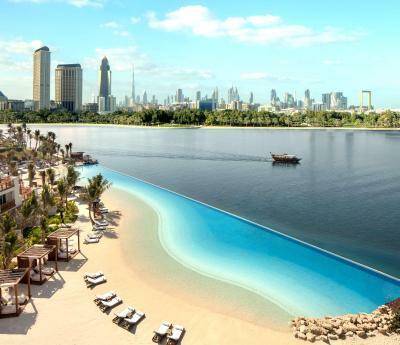 Very beautiful resort in the middle of Dubai with breathtaking view of Dubai khour, marina & skyline. Nice resort with perfect views to khor Dubai and marina. Everything spically the stuff was very helpful and special Thanx for Ms Sophie. Park Hyatt Dubai This rating is a reflection of how the property compares to the industry standard when it comes to price, facilities and services available. It's based on a self-evaluation by the property. Use this rating to help choose your stay! Park Hyatt Dubai features a 100 feet swimming pool set among palm trees and a spa offering aromatherapy treatments. It is 1.2 mi away from Dubai International Airport. Guests can enjoy free WiFi throughout the property. This property offers complimentary parking and valet. Park Hyatt Dubai has rooms with deluxe bedding and feature floor-to-ceiling windows opening onto a furnished balcony. Each room has cable TV, a well-stocked mini-bar and private bathroom with marble bath. The luxury resort features world class dining outlets including Noepe restaurant which serves sea food and offers breathtaking panoramic views and The Thai Kitchen with authentic Thai dishes prepared by native chefs in three open kitchens. Brasserie du Park is a modern international eatery that showcases a variety of brasserie-style dishes ideal for sharing over casual conversations within a lively ambiance. 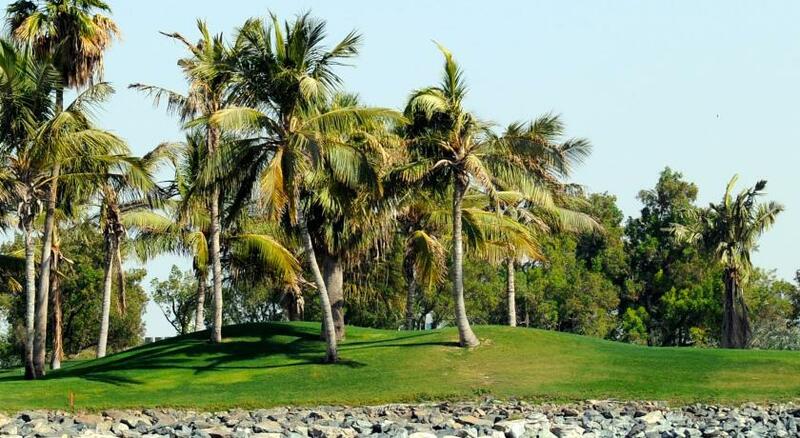 Guests can practice their swing at the 18-hole championship golf course which also offers a floodlit driving range. 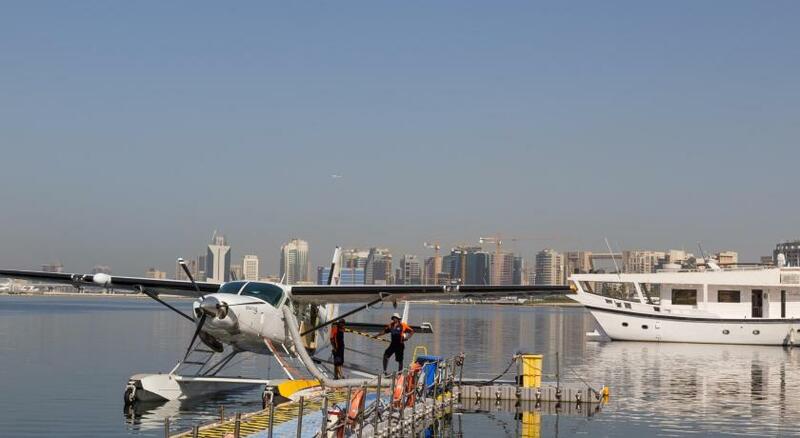 Yachts can be chartered from the Dubai Creek Golf and Yacht Club. Dubai Mall and Burj Khalifa are 15 minutes away by car. The hotel is a 30-minute drive from Dubai Marina.. When would you like to stay at Park Hyatt Dubai? Inspired by Arabic architectural heritage, with Mediterranean and Moorish influences. This spacious 2 bedroom suite, consists of 2 rooms which are interconnecting (Park Suite and Park Twin Room), a waterfront balcony and terrace each providing views of Dubai Creek, a living room, work space and 2 elegant bathrooms, each with a tub and a walk-in shower. It also includes 2 adjustable satellite TV’s, complimentary mini-bar in the Park Suite (refreshed once per day) and extra long bed. Extras include daily fresh fruit, mineral water, newspaper and high speed internet. The spacious 52 sqm Park King room is a waterfront retreat featuring patio with marina views. It offers elegant interiors, including elegant bath with tub and walk-in shower, work desk with complimentary wireless internet and king bed with cotton linens and goose down duvet. Pampering extras include daily fruit and mineral water. The spacious 109 sqm Park Suite features separate bedroom, living and patio areas with views of Dubai Creek. It offers a cozy lounge sofa and chairs, full bar, work area with complimentary wireless internet, bath with separate tub and walk-in shower and bedroom with plush king bed. Luxurious extras include daily buffet breakfast, soft bathrobes and daily fruit, water and newspaper. Featuring a private terrace provides stunning views of Dubai Creek, the spacious 105 sqm suite offers separate living and work areas. Elegant decor complements cozy chairs and sofa, full bar, bath with separate tub and walk-in rain shower and bedroom with king bed. Luxurious extras include daily buffet breakfast, complimentary wireless internet, soft bathrobes and daily fruit, water and newspaper. The luxurious 55 sqm King Deluxe concept room offers generous wardrobe space and vanity counter for increased comfort, especially enhancing long stay experience. Ideally located within close proximity to the swimming pool area, this room includes a full steam and shower room. It has a private patio which offer Dubai Creek and park views, a plush living area includes a cozy sofa and chairs, and separate bedroom features king bed with cotton linens and down duvet. Enjoy complimentary wireless internet, daily fruit and mineral water. The spacious 52 sqm room is a waterfront retreat featuring patio with marina views. It offers elegant interiors, including bath with separate tub and walk-in shower, work desk with complimentary wireless internet and two twin beds with cotton linens and goose down duvet. Pampering extras include daily fruit and mineral water. The spacious 52 sqm Skyline View room is a waterfront retreat featuring balcony or patio with views over Dubai's skyline. It offers elegant interiors, including elegant bath with tub and walk-in shower, work desk with complimentary wireless internet and king bed with cotton linens and goose down duvet. Pampering extras include daily fruit and mineral water. The spacious 52 sqm Skyline View room is a waterfront retreat featuring balcony or patio with views over Dubai's skyline. It offers elegant interiors, including bath with separate tub and walk-in shower, work desk with complimentary wireless internet and two twin beds with cotton linens and goose down duvet. Pampering extras include daily fruit and mineral water. This double room features a private balcony with breathtaking views overlooking the azure lagoon. Elegant bath with tub and walk-in shower, work desk with complimentary wireless internet and king bed with cotton linens and goose down duvet. Pampering extras include daily fruit and mineral water. This twin room has a private balcony with breathtaking views overlooking the azure lagoon. Elegant bath with tub and walk-in shower, work desk with complimentary wireless internet and two twin beds with cotton linens and goose down duvet. Pampering extras include daily fruit and mineral water. House Rules Park Hyatt Dubai takes special requests – add in the next step! Park Hyatt Dubai accepts these cards and reserves the right to temporarily hold an amount prior to arrival. Please note there is a compulsory Non-Refundable New Year’s Gala Dinner for all guests staying over 31 Dec 2019 fixed to AED 1550 per adult and AED 775 per child (6-12 years) Please note the Gala dinner charges are additional to the room rate booked. The carpet in the corridors!!! It seemed dated and didn’t match the amazing interiors throughout the rest of the hotel! The quiet, relaxing vibes throughout. The staff were also amazing. As was its cleanliness. Friendly and professional staff! Amazing room vie! And the variety of the breakfast is the best experience! Highly recommended!! a specious place highly recommended for relaxation. Wonderful setting by the creek so spacious with birds and greenery everywhere. the rooms were spacious and modern, the facility itself has amazing views. we had a room overlooking the creek where the yachts are docked and right by the restaurant. We also participated in their Thai Night (a buffet of authentic Thai food) at the Thai Kitchen. The food was amazing. Also the buffet breakfast which we paid for was amazing and worth the money. Will definitely stay here again on our next trip. The tax wasn’t fully calculated by booking.com so it was higher than we expected. The room wasn't ready when i reach the property, even if i was there at 4pm , I received my room near 5pm. 1. Mind boggling poor customer service for a five star hotel. My girlfriend had a small bite at the swimming pool (18€). She gave her room number and signed the bill. About an hour later we went back to our room and had a nap. We were woken up by a call from reception. When we answered the phone there was nobody on the other side. Shortly after the doorbell rang. When I opened the door there was a staff member holding a cash machine telling me that the reception had tasked him to ask me to already pay the bill and that he did not want to get in trouble (?) Given that I was not fully dressed I asked him to give me a couple of minutes and ensured him that I would go the reception and pay the bill. When I arrived at the reception they could no longer find the bill and had to go looking for it. About ten minutes later they found it and I immediately settled it. All the rest had already been paid for. All this fuss for 18€. Why could they not wait until the next morning when we were checking out? For the record I ve never left a hotel without paying the bill in my entire life... 2. There was a wedding taking place. Neighbour was having a little party on his terrace at night. 3. A lot of crows picking food from the plates at breakfast. 4. Noisy planes constantly landing and taking off from the Creek right in front of the swimming pool. 5. Far away from the main attractions. 6. Not allowed to swim in the creek.